Even with all of my Mother in Law's ornaments, I think our tree is looking a little bare. 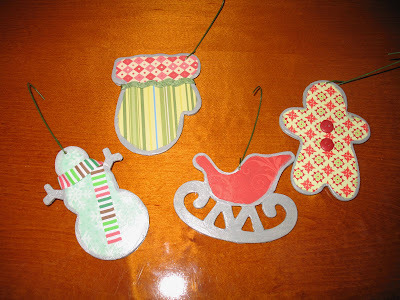 Luckily I found this blog, which is featuring a different homemade ornament every day this week! I decided this was perfect for my tree. If you go here you will find the tutorial I am following. Step 1: Become a follower of my blog. Just go to your Dashboard, and Add my URL. If you are already a follower, post a comment telling me so. Step 2: Leave a comment on this post, and tell me about your favorite Christmas Tradition. It can be one from your childhood, one you do now, or one you heard about and are dying to try. Step 3: Do these things before Sunday night, at midnight. That's it. Only one entry per person this time, too. And since these are lightweight, I am willing to ship internationally. OF COURSE I'M ALREADY A FOLLOWER!!!! I too am a follower. Our family tradtition is to make a birthday cake for Jesus. It's his birthday and it's an easy to for the kids to understand it. When we were kids we would go to my Grandparents house every Christmas Eve and open presents and have a big dinner. EVERYONE would come. It was so much fun. Our favorite Christmas tradition is on Christmas Eve, after we get back from which ever Grandparents' house we were at, we all get to open 1 present, and then we drink yummy Hot Chocolate and listen to Christmas music. It's quiet, peaceful, and not a big rush like Christmas morning is. I really enjoy it, and it gives me motivation to wrap my presents early! Those are so cute! I want them! There are so many traditions to choose from. I'd have to say that my favorite is making Christmas cookies up til Christmas, and then on Christmas Eve eating them all, reading the nativity story, and opening a new pair of pajamas and a book. :-) Also, starting this year, Michael and I are going to think of a gift we can give to Jesus, something we can do for him throughout the year. I'm a follower now! Thanks for sending me the link. One of my favorite Christmas traditions (and a crafty one you might like) is a tablecloth we do every year on Christmas Eve. My mom just surged around a white sheet to make a big tablecloth (big family) for our table. Each year everyone draws a picture, in pencil. It can be some landmark event that happened the previous year (graduation, marriage, driver's license) or it can be a talent or favorite thing. Then my mom embroiders the drawings before the next Christmas Eve. It's always fun coming up with pictures, and is a great way to remember the blessings of the year! Hehe... I'm a follower too. I have a tradition that I plan on starting next year. I will be gathering as many books about Christmas, snow, snowmen, etc. that I can find over the year. Next year I'll wrap the books at the beginning of December. Sheridan will then get to pick out a couple books to unwrap every night to read till Christmas. The books will be packed up with the Christmas decorations and pulled out again the next year. That way they are new to him. I read about this somewhere. I figured this would be perfect since Jim and I are such book junkies. 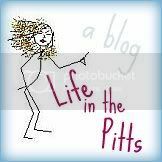 I now follow your blog! My favorite childhood tradition was having the real santa come to our christmas eve party and we got to open presents then and on christmas day. it was fun! But I am dying to try the elf on a shelf tradition on my kids.